Hello! 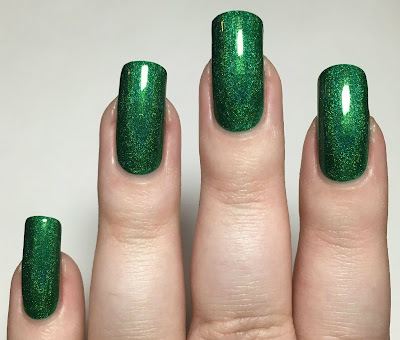 As promised, I am back with my swatch of Danglefoot Nail Polish 'Zelena' from the recent Once Upon A Time Duo. If you missed my swatch of 'Regina', you can find my post here. As mentioned in that post, this duo is a collaboration with Faye (@littlef218 on Instagram). Read on for my swatch and more info! 'Zelena' is a rich emerald green linear holographic. The formula is very smooth and easy to apply. The first coat covers really evenly, but is just sheer enough that I could see my nail line. A quick second coat darkens the colour slightly and covers completely. The holographic in this is gorgeous! Below is two coats and topcoat. What do you think? It's stunning! 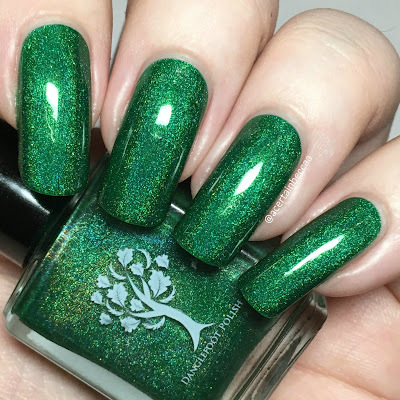 Anyone who knows me knows that I have been obssessed with green polishes recently, and this is a perfect example why - just look at it! This is the perfect colour for Zelena's character. 'Zelena', along with 'Regina', is going to be restocking once more over on Danglefoot Nail Polish's store here. Make sure to follow Hayley on Instagram here to find out when they will be returning. Lovely polish and what a swatch - your nails were made for green polish, it really suits you.